What can you do with too many tomatoes? Late in the summer, home gardens begin to burst with produce. The energetic gardeners who could hardly wait for their first fruits begin to moan at the prospect of yet another day’s bumper crops. Leaving a zucchini on the vine for another day brings a monstrous increase in size. How could they grow that much overnight? 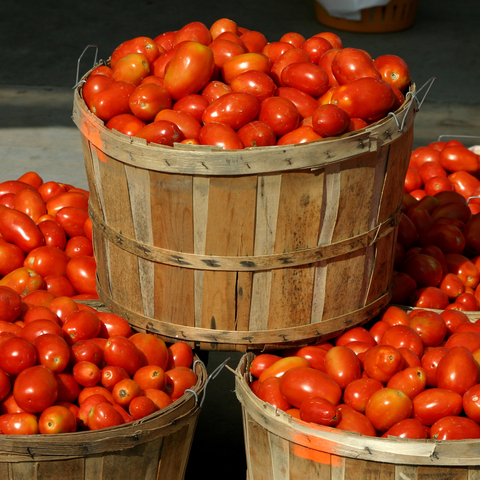 What can we do with tomatoes that we haven’t done before? Even if you have never personally struggled with the challenge of too much of a good thing from your garden, you can enjoy today’s topic. This story should also appeal to the latent child in all of us. If you have a garden AND children, gather the family for the story! Before the tomato fight, there is a contest to see who can get a ham from the top of a soaped pole, but that is just a warm up. At eleven o’clock the starter’s gun is fired, marking the beginning of the real fun. Industrial trucks filled with tomatoes from a western state drive into the central square and dump out the bright red fruits. Tons of tomatoes are consumed as people throw them at each other and anything else that moves for the next hour. At noon another shot goes off signaling the end of “hostilities.” No tomato is thrown in genuine anger, but feelings certainly do run high. By now the combatants are standing in ankle-deep tomato pulp, totally thrilled and exhausted. The first pictures I ever saw of this event showed walls dappled with tomato blotches up to about eight feet above the ground. The next question is how on earth do they clean this up? Fire hoses wash the pulp away, revealing walls and bricks made sparkling by the acid content of the juice. Can’t you imagine the tomato-y footprints the revelers leave as they make their way home going “squish squish squish”? Take a look at the website here from the Spanish department of tourism for more description of the event, and the site for the festival itself with lots of pictures. In one picture showing a truck pulling into the square you can see tarps protecting the surrounding balconies! This is not the Olympics, but it would be lively and fascinating to watch! More than anything the pictures remind me of this wonderful pie fight from The Great Race. Whether you opt for ketchup or Crème, enjoy! This entry was posted in Uncategorized and tagged Bunol, festival, food fight, Spain, Tomatina. Bookmark the permalink.